You’re part of the the best gin club in the UK, you've got your carefully picked tonic, an exciting new craft gin you've been dying to open all you need is a beautiful gin glass to enjoy it in! This selection is our top picks of gorgeous gin glasses, perfect for Christmas Gifts or to treat yourself! Gin is the reason for the season so what better way to enjoy some Christmas Spirit than in these glistening beauties? These iridescent beauties are elegant, pretty and just the right shape for the perfect gin and tonic! 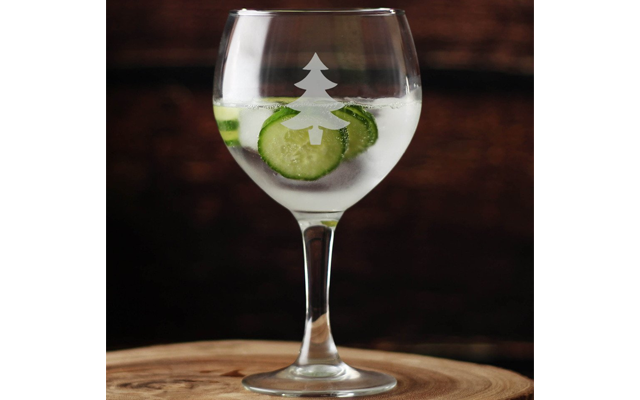 You’ll get some nice pine notes from these Christmas Copas! We love the subtle colour on these gin copa glasses, very reminiscent of the traditional copas you would find in a Spanish gin bar - pour yourself a G&T in these and image you are sipping it on the Costa-de-Sol! Celebrate cocktail hour in style with this pair this pair of gold embellished gin glasses. 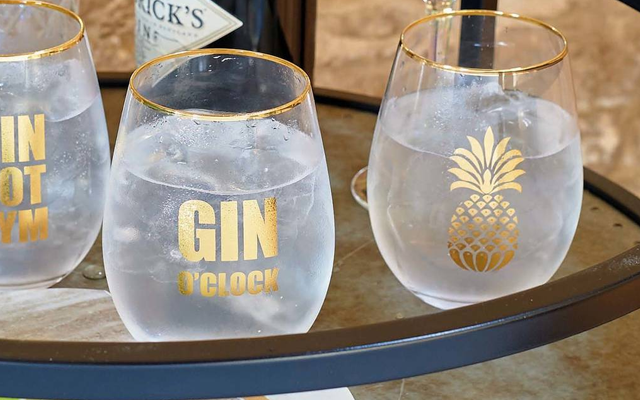 Each set comes with 2 glasses, you can choose your choice of two with the slogan 'Gin O'Clock' or two with gold pineapple design. Remember Unicorn Gin? 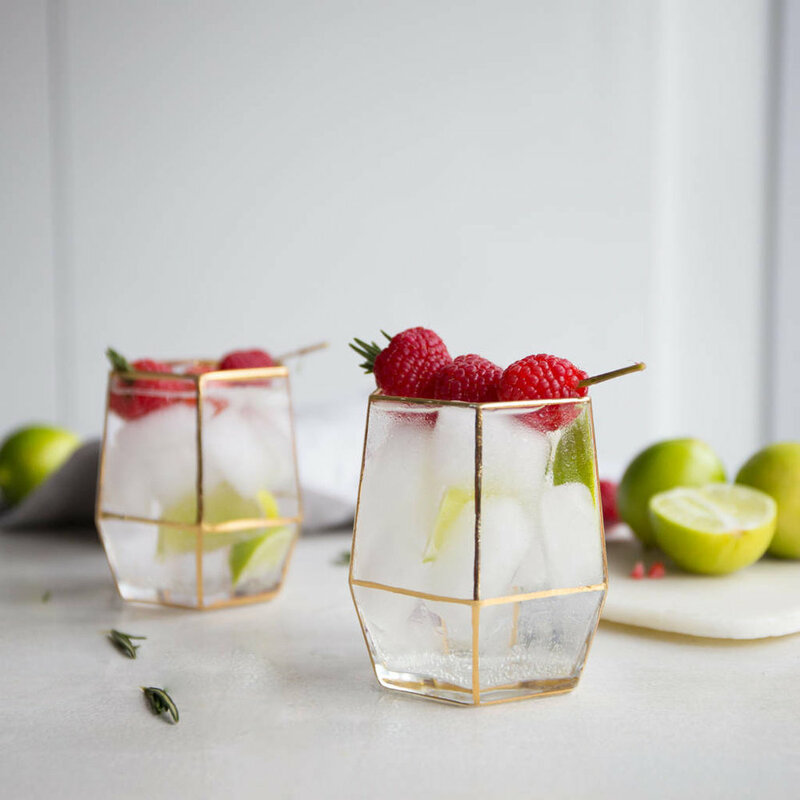 Well, we’ve found the BEST gin glasses to drink it in! These golden wonders were made for the sparkly, pink liqueur! Rose gold is the colour of the moment! 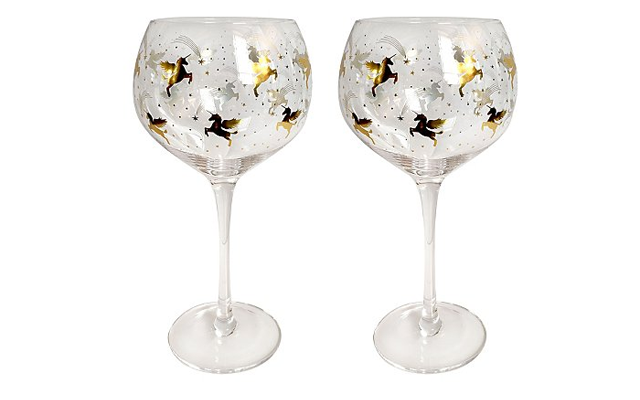 These gorgeous metallic copa glasses are so beautifully unique and just perfect for the festive period. These beautiful hand painted gin glasses are getting us in the mood for drinking g&t's in the sunshine - and if the weather is being a bit "British" you can bring the warmth indoors with these tropical designs! These bedazzled copa gin glasses from scruffylittlecat are the perfect gin gifts for your GFF (gin friend forever) and you can personalise them how you like - although who doesn't want encouragement to have another gin?! A great bridal party gift idea! These gorgeous pastel hued LSA gin glasses are hand blown in Poland, and finished with a delicate lustre that's got us feeling spring! There's 6 pretty shades to choose from to take your cocktail hour to the next level! We like it when our glasses come with instructions, so no one needs to ask what should be done with it if it's empty! Perfect for that first evening of trying your new Craft Gin Club goodies! Give your gin glasses some glamour with these crystal gin glasses, finished with a swirling Swarovski design! Also available in Martini, Highball, Tumbler and Copa style to add a sparkle to your glassware collection - and for a special touch you can make it a personalised gin glass with their engraving service. After something a little less conventional? This stunning iridescent rainbow glass tea set allows you to infuse your gin, before drinking it in true British style - pinky raised of course. Bringing the g&t to your next afternoon tea or picnic! These gorgeous, glittering glasses are hand decorated and come in a range of colours, with the option to glitter up the stem, and add a brush lettered engraving on the bottom! Another fabulous gin glass gift choice for bridesmaids, best friends - or yourself! The Libbey Speakeasy range is a total throwback to the roaring 20's, and these sharp detailed Coupe glasses will bring that Prohibition era feel to your gin evenings! The Flute glass, Balloon glass and Martini glasses are also available to jazz up your collection. Another beautiful set from the masters at LSA, this Mother of Pearl sheen gives an almost ethereal look to these glasses, and adds subtle iridescence to special occasions and a touch of luxury to everyday dining - just imagine sipping a blue aviaton cocktail from one of these. Dreamy! All Things Brighton Beautiful wants you to take a stand against the standard, everyday drinking glass and turn to the new age. Upgrade to the future of drinking differently and make a statement with gold, elegant and bold edges!